We had a fantastic experience at Tamra Hollowell salon . Christy from Blush Bridal referred us. We had a great time . Great hair people and makeup artist were fantastic. Sarah Pearce Pro was fantastic . My daughter use her for a photo shot. She great in what she does. We all looked fantastic. People were commenting how nice we looked. I look forward to using Sarah in the future. Highly recommend this Salon. I used the Tamra Hollowell salon for a series of airbrush tans. I had never gotten one where the esthetician actually airbrushed you personally-- always in the booths. The esthetician, Elle, was amazing! I always felt comfortable with her and she always did a great job. Each time I came in, she remembered which color formula and little things I told her about. Today when I got my final airbrush for my wedding, she asked if the big day was this weekend. I hadn't seen her for 4-5 weeks. I will definitely be using their services again! This is actually a review based on booking on behalf of someone else...at the very last minute, there was a guest at our meeting who needed a quick blowout before a speaking engagement. Tamra was responsive, incredibly friendly, and flexible. She was accommodating to our guest who's hair looked wonderful throughout the day. Thank you! 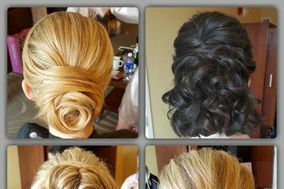 Tamra and her crew helped fashion hair and makeup for all 9 bridesmaids, two flower girls, and the MOB within a three hour time slot. Her salon manager listened to our needs and concerns and scheduled and rescheduled the ladies perfectly. Tamra worked on my hair at least two times until my daughter and she were both satisfied. I was surprised to see my daughter's hair stayed in place the entire night which is unusual for her. I have pictures of the beginning of the wedding to the end of the night, and each curl is still there- no frays, no frizz-just beautiful hair that withstood hugging, dancing, and enjoying the evening.